* Back in 2011 when special forces raided the compound in Abbottabad, Pakistan and killed Osama bin Laden, the intelligence community gained access to a trove of documents – some of which were just declassified. Al Qaeda’s leaders were increasingly worried about spies in their midst, drones in the air and secret tracking devices reporting their movements as the U.S.-led war against them ground on, documents seized in the 2011 raid on Osama bin Laden’s Pakistani hideout and reviewed by Reuters reveal. The documents – the second tranche from the raid to have been declassified since May 2015 – depict an al Qaeda that was unwavering in its commitment to global jihad, but with its core leadership in Pakistan and Afghanistan under pressure on multiple fronts. * Not too long ago Donald Trump told Bill O’Reilly that, as president, the one thing voters could count on is that he would be unpredictable. Last night he told Sean Hannity that “everything’s negotiable.” You might think that kind of talk wouldn’t fly with folks who think that the greatest sin of the Republican establishment has been their willingness to compromise with President Obama. But believe me, I gave up trying to make logical sense of the Trump supporter mentality a while ago. * These days I’m almost tempted to feel sorry for Republican candidates. Their choices are getting increasingly difficult these days. The Club for Growth is issuing a warning to its stable of congressional candidates this fall: Endorse Donald Trump and you might just lose your backing. The conservative group, which specializes in supporting outsider candidates that challenge centrist-leaning Republicans, is actively considering denying endorsements to any candidate that endorses Trump while the primary is still being contested, according to a source familiar with the Club’s endorsement process. “They think they are going to wait and see what President Trump will do I guess as far as the [SCOTUS] nomination is concerned,” Reid said at the stakeout. Yep, if Trump becomes the nominee, that makes it even more difficult for Republicans to maintain this strategy. 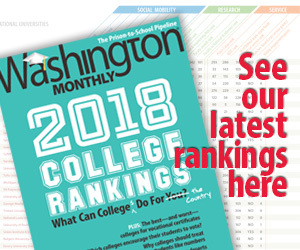 A foundation-sponsored project launched this week by The Washington Monthly magazine aims to plant philanthropies’ good works directly under the noses of influential policy makers. Successes of Philanthropy will serve as an online catalog of philanthropic wins — something its creators believe Washington power brokers need to hear more about. If it took a Donald Trump candidacy for conservatives to finally recognize the way that nativist bigotries have animated the Republican Party since the dawn of the Southern Strategy, that is a sad commentary. But I begin to contemplate the possibility of whether late is better than never.